Designed and manufactured by Potterton, the Gold 24kW System gas boiler is a condensing, wall-mounted boiler that comes compact in size. This is a highly efficient boiler, as shown by its seasonal efficiency rating of 89% and ErP A rating, which could help you save money on your energy bills. With an output rating of 24kW, this Gold boiler is perfectly suited to medium-sized homes, with 2 bathrooms, that don’t have such an excessive need for heating and hot water. Whether your home requires a higher or lower output, there’s a model in this range to suit you as 18kW and 28kW units are also available. Some of the benefits of this cost-effective Potterton boiler include pre-plumbing jig for a faster installation, flue lengths of up to 20 metres to offer flexibility in where it can be placed and built-in frost protection to ensure that it keeps going through the winter months. As this is a System boiler, it sits somewhere between Combi and Regular boilers. 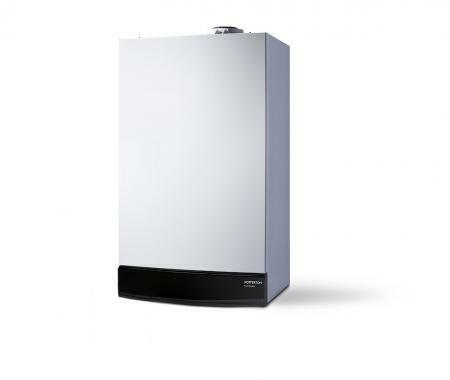 System boilers directly heat your central heating system and hot water for a storage cylinder. Most of the important parts of the hot water and heating system, such as the pump and expansion vessel, are built into the unit itself, which makes installation quick and clean. You’ll also be getting a faster response to demand for heating and hot water, than with a Regular boiler. Featuring a 2 year warranty, you’ll be well covered by Potterton long after the installation.